Tasting notes: This tea has lovely hints of muscatel and good strength, similar to an excellent Darjeeling. An organic black tea from Nepal’s first co-operatively owned factory. The term “golden” refers to the high number of buds used to make this rare black tea (one bud to one following leaf to be exact – 1+1). Harvested in the autumn, it carries notes of chocolate and cherries and is nearly impossible to over steep. Ilam estate has a Darjeeling-like character with good muscatel flavour. Some may ask: ‘What is the muscatel flavour?’ When you taste this tea you will experience an almost perfume like character that some tea drinkers call ‘Chanel like’: others call the character ‘slightly over-fired’ or oaky. The muscatel flavour is the natural taste of the tea – becoming more pronounced during April (light tasting with astringency and intense flavour) and June (intense flavour with more body). The flavour is on account of the altitude of the tea estate, the soil conditions in the Himalayas the weather patterns, temperature, the originating species of the bush (Chinese genus as opposed to the Indian genus) and fermenting techniques; it has nothing to do with the tea being over-fired (over-fired is a description of poor manufacturing techniques). 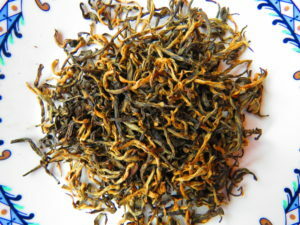 The leaf appearance is very typical of a well-produced high mountain grown Nepalese tea. It appears mottled with brownish and greenish leaf – almost camouflage-like. This appearance is caused the myriad of different mother bushes, the older age of the bushes and the subsequent fact that the leaves ferment differently. The area where Ilam is produced is high in the Himalayan Mountains. The slopes where the tea is produced are extremely steep which makes it very difficult for the tea pickers to go about their work. At Ilam one is surrounded by the high snow covered peaks of the world’s highest mountains. It is truly a very scenic area. The quality of this tea befits the tremendous efforts undertaken to produce the tea and the beautiful surroundings.